← The End of The World… and I Feel Fine! Below are two extended quotes by Andrew Murray (1828 to 1917) from his book entitled “Revival”. Murray was South African writer, teacher, and Christian pastor who believed the “Great Commission” as given by Our Lord and Savior, Jesus Christ is the chief end of the church. During his life and ministry, he personally witnessed the revival of the church in South Africa, as it began in his congregation. Murray has written many classic Christian works, on healing, ministry and most famously prayer. His book “With Christ in the School of Prayer” is a must read for every follower of Jesus. His writing here needs no further comment from me, but feel free to comment on what you read below. 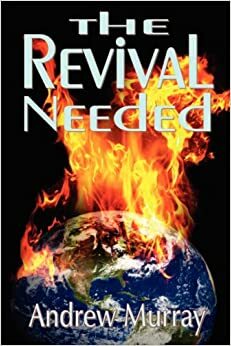 “If revival is to come — greater, deeper, broader than any that has yet been — one great part of its powers will be in the conviction it will bring. Many of us will be convicted of the sin and shame of all the carnal ease, and comfort, and self-indulgence in which we have been living — while the dying, perishing world that has been given into our charge was waiting for us, and the infinite love that had entrusted self to us was mourning that we were to slow to go and tell of it. The conviction of sin must be greater, deeper, broader than we have known it. Judgment will have to begin at the house of God. The great deep will have to be broken up. The formality and the worldliness, the selfishness and self-confidence, and the self-complacency of much of our Christianity will have to be revealed in the light of the actual life, worship, devotion, and self-sacrifice in the power of the Spirit to which God has called us. Above all, the sin of having had the love of God to the world given into our hearts for the one purpose of communicating it, and then having congratulated ourselves on the small gifts of silver or gold for which we sought to commute our personal service, will become such a burning thing that our penitent confession and our cry for deliverance will work and entire revolution. We shall indeed yield ourselves and wait on the Holy Spirit to work the life of Christ Jesus in us that, even as He, each of us in our measure may live exclusively for the glory of God in the salvation of the lost. The sin of this neglect in the church of God — in not accepting and proclaiming this great “whosoever” (to whomever will receive the gospel) of God’s love, in not living to make God’s love known — has had and is having such appalling consequences that even Christians fail to realize what is meant. We are told that every year there are thirty million unbelievers passing away into utter darkness. We count up those years and think how this has been going on through the ages since Christ gave the great command to His church as its watchword. The mind refuses to comprehend it. It is as if this wonderful love of God might have interfered, might have done more. It looks as if it is to awful to put upon the church, upon us Christians of today too, the burden and the guilt of these perishing multitudes. And yet it is so. The Father in His love gave the Son to reveal it on earth. The Son committed it to His disciples, to His body, the church, with a charge as plain as words can make it. Carry that love to every creature, to all nations, to the ends of the earth. That was the one thing the church was sent into the world to do — even as He had been sent, and for nothing else. It is due to nothing but selfishness, unfaithfulness, and neglect on the part of the church that this holy mission has no yet been accomplished. More than one person has said: ‘We have been playing at missions.’ And yet how we congratulate ourselves on all the wakened missions interest! And all the while the number of believers who really follow in the footsteps of Christ — counting their joy to give their whole heart and strength, to live and die, whether in prayer or in work, for the glory of God in the salvation of others — is so small” (pg. 68-70). “The question will be asked, and is most needful and natural that it should be asked: How is it, if God really meant His children thus to bring His love to their fellowman in the way Christ brought it — by living and dying for it — how is it that the church has failed so terribly? Does God’s Word actually teach and claim such entire devotion? Is it indeed an attainable degree of grace, a state that can actually be realized? Or must we take into account the weakness of the human nature, and consider the present state of the church as all that could really be expected? We must indeed take into account the weakness of human nature, but only in a much greater degree than is usually done. It must be seen that human weakness is such utter impotence that it makes the life of God on earth an utter impossibility except as the supernatural power of the working of God’s Spirit is waited on and experienced. And if the question be again asked how it is, God’s Spirit is not more sought and known, the answer leads us again to what we have called the root evil of the low estate of the church. It is because God’s wonderful commands and promises are all understood and accepted in a certain human sense, not in their divine quickening meaning and power”(.pg 68-70). May God quicken our heart, mind and soul to the leading of the Holy Spirit as He directs us unto taking up the ministry and cross of Jesus, until the whole world hears!!! Mike is a pastor with The Christian and Missionary Alliance in the Rochester N.Y. area at "The Savior's Chapel". His desire is to encourage the Church of Jesus Christ, and declare God's hope through His Son Jesus, to a world which is long on excuses and short on hope. Mike has experienced the truth that when we kneel before Christ, surrendering to Him as Savior and LORD, we truly can rise above this world and the sinfulness that entangles us. We can Defy Gravity. This entry was posted in Andrew Murray, Revive me, Uncategorized. Bookmark the permalink.